Time to start thinking about high school sports. 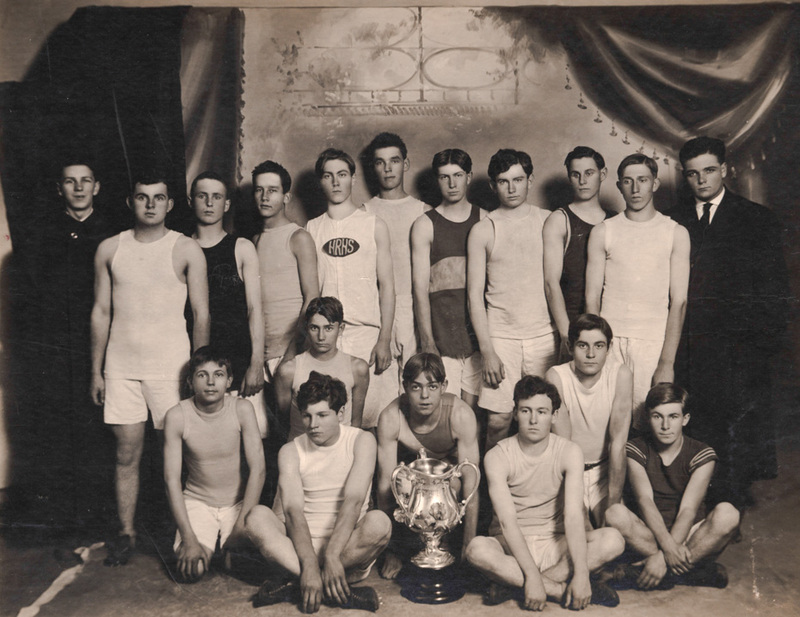 Meet the Hood River High School Track team of 1909-10. Looks like a pretty nice trophy they brought home. I quickly glanced through some 1910 May and June HR Glacier issues. The only thing I found was a dual meet with Jefferson High School in the May 19 issue. Hood River was victorious, but nothing about a trophy. Some of the HR names: Huggins, Sosey, Bell, Sruck, Stockton, Clapp, Ingalls, Ross, Eby, Murphy. There are articles about "good roads meetings", which makes one realize there were no roads for these athletes to travel Portland/Hood River. They would have to take train or boat. There is an add for Huggins grocery store, discussions about a municipal water plant and sewer. The 1912 Hood River High School Mascot lists the current and past graduates of the school. It is likely not all of the pictured boys were seniors or graduated, but here is the list of graduating boys from 1910, 1911, and 1912 - 1910: Herbert Phillis, Ray Nicholson, John Copper, Sherman Buck, Steve Eby, Merrill Gessling, Roger Moe, Harry Clapp, Walter Kresse, Will Cass, Chester Huggins (a great runner at U of O). 1911: Donald Onthank, Fred Bell, Forrest Moe, Wyeth Allen, Lynn Young, Earle Spaulding, Lester Murphy. 1912: John Coshow, Glen Corey, Walter Shay, Will Sheppard, Emmet Thomas, Edward Struck, Orland Morse, Marshall Pineo. The fourth boy from the left, back row, is Burton Jayne (identified from family photographs we have from the era). In 1917, he was in France, fighting with the Rainbow Division, U.S. Army. He survived for the duration, coming out of the war as sergeant major. He died in the early '50s. If Mr. Jayne came out of WW I as a sergeant major he was no slacker.. My dad served in the Rainbow Division in WW II. Playing sports in high school was an advantage if you went in the army. You knew how to sweat. Thanks Jeffrey for finding Chester Huggins at U of O. I saw a HHR Glacier article where Stanford was looking at him for a track scholarship, but couldn't find any more. He went on to coach and teach at Milwaukie and Klamath high schools. I agree that high school sports teaches toughness and discipline. Remember when President Kennedy instituted his physical fitness agenda into the school P.E. programs? Our military was getting kids that were too soft. I thought this article in the April 28, 1910 HR Glacier was worth a read. Huggins travels to Stanford to run in the Interscholastic Track Meet. It says he took some literature about the Hood River Valley and some apples.